Muchavista beach is an extensive beach with fine, golden sand over 3 km long and 80 m wide. 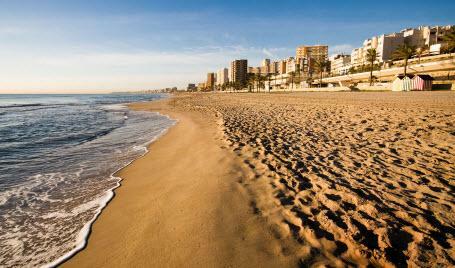 As with Carrer la Mar beach, it has been awarded the Blue Flag by the European Community. Located in a semi-urban area next to San Juan beach, it is a marvellous location for swimming, water sports such as windsurfing and walking or running along its 3 km long pedestrian promenade, conveniently situated beside the modern tram line linking Alicante and El Campello every 30 minutes. There is also a section of the beach especially equipped to provide access for people with reduced mobility. During the summer months, it hosts a complete programme of activities such as cinema, sports, a mobile beach library,play areas, rental sunbed...which, together with its tourist facilities and infrastructures make it an ideal destination for all tastes. At the north eastern extreme, where the coast joins the Muchavista beach, lies an idyllic little spot where small boats rest on the water’s edge. By Tram: Stop - Carrabiners, Muchavista, Les Llances, Fabraquer y Salesians.